Shredded Beef Chipotle Enchiladas are a big hit in my house full of men. 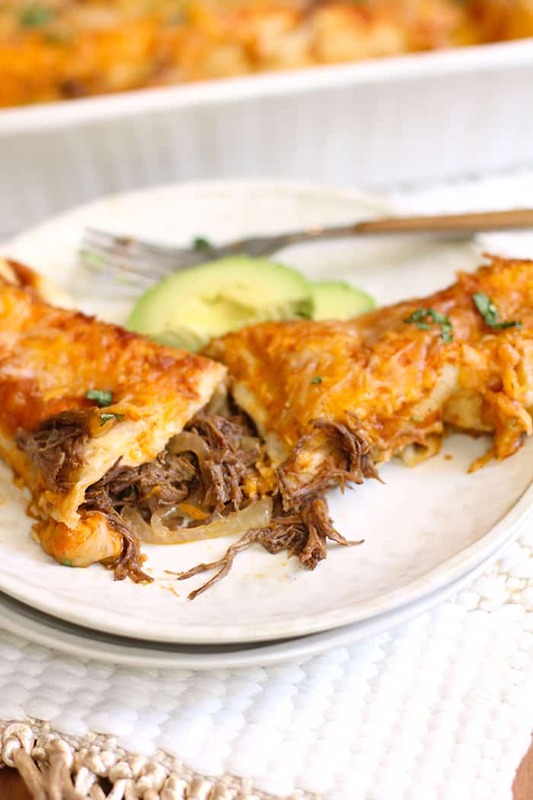 Perfectly tender shredded beef with a chipotle kick, wrapped in flour tortillas, and topped with an amazing homemade enchilada sauce and shredded Mexican Cheese! Oh yes. Here’s the thing about enchiladas. I NEVER order them when we go out, because they are always swimming in cheese sauce. No thank you. That’s why I knew I needed to concoct something light on the cheese but filling for my family. With a kick. Because I’m not eating bland Tex-Mex. No way, never ever. Ever! Roast beef makes the most amazing enchiladas. In fact, I made two slabs of it recently because I took some to Josh at college. He requested homemade enchilada sauce, so I decided to make the beef too, and bring him the ingredients to put this dish together after we leave. Here’s the lowdown on how to prepare the meat. Season the beef on both sides, with a mixture of garlic powder, onion powder, red pepper flakes, and salt and pepper. Let it rest to almost room temperature. Brown the beef on medium-high heat to get a good sear on ALL sides. This will keep all those juices IN the meat. Saute the onion and garlic, and then add the tomato paste and beef broth. Add browned beef back to pan and top with diced chipotle peppers. Shred and TRY not to nibble too much. The diced chipotle peppers are not too spicy. They will give the meat a wonderful flavor, and you’ll wonder (like I did) why you don’t throw them on all of your roasts ALL of the time! For real. 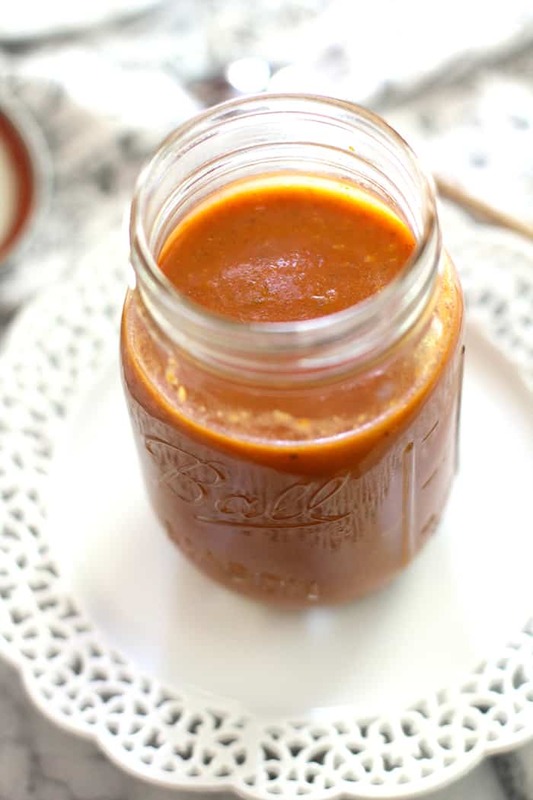 Next up is my homemade enchilada sauce, that absolutely MAKES this recipe. You can make this up ahead of time, along with the beef, and dinner is ready in less than an hour. The enchilada sauce freezes well, so just take it out when you need it. 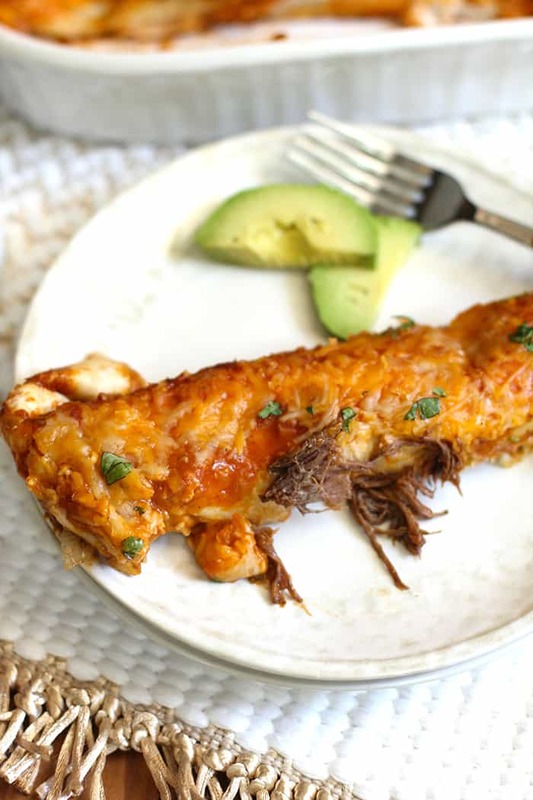 I used about a jar and a half for these Shredded Beef Chipotle Enchiladas. The remaining amount can be added at the dinner table, if desired, or saved for another day. My recipe makes enough to fill a 9 x 13 pan plus another small one. I was thankful for that extra amount, because leftovers always go fast. And if you are smart, and the only lady in the house like me, you could actually HIDE the extra enchiladas and eat them when nobody is home. For some other great Tex-Mex meals, try one or ALL of the following. My Spanish Rice is a good side dish for these Shredded Beef Chipotle Enchiladas. But I’m also working on a Cilantro Lime Rice side (recipe coming soon!) that I served with this recently. Both are really delicious. 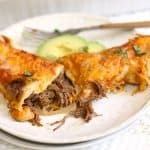 Perfectly tender shredded beef with a chipotle kick, wrapped in flour tortillas, and topped with an amazing homemade enchilada sauce and shredded Mexican Cheese! Season beef on both sides with salt, pepper, garlic powder, onion powder, and red pepper flakes. Rub spices into meat. Add olive oil to same pan and add olive oil, onion, garlic, and tomato paste. After a minute, add beef broth and stir. 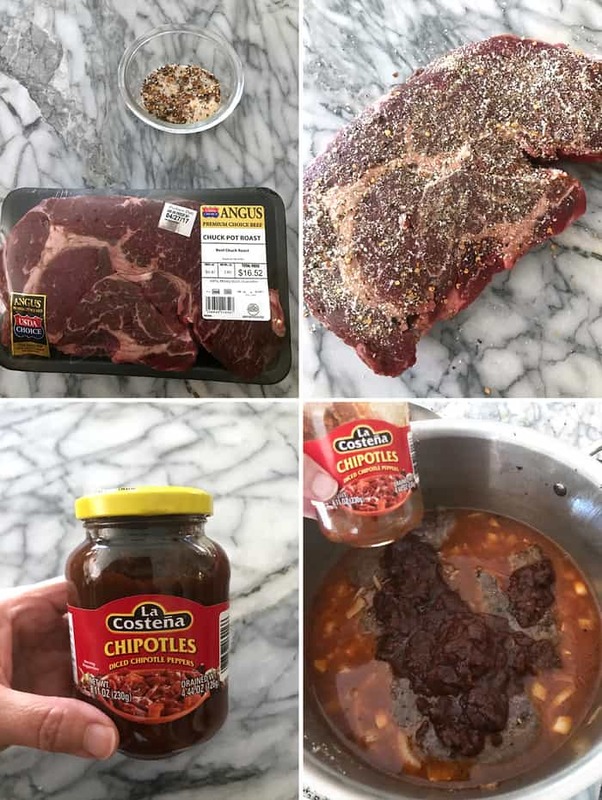 Add beef back to pan and pour chipotle sauce over the top. Bring mixture to a boil and reduce to low. Cover with lid and simmer for 2 - 3 hours, or until meat is VERY tender. When meat is done, remove and let cool slightly. Shred with two forks and remove visible fat. Using a slotted spoon, remove as much onion as possible from liquid. Add onions to meat and stir. Heat medium saucepan to medium heat. Add olive oil, onion, and jalapeño and cook until soft. Add garlic and stir for another 30 seconds. Add chili powder, cumin, salt and pepper, and stir for one minute, allowing spices to soak in. Add flour and stir for 2-3 minutes. Mixture will appear to be dry. Add chicken broth tomato paste, and tomato sauce, and cook for 15-20 minutes, allowing sauce to thicken. Remove and let cool slightly. Take immersion blender and puree enchilada sauce until smooth. Preheat oven to 350 degrees. 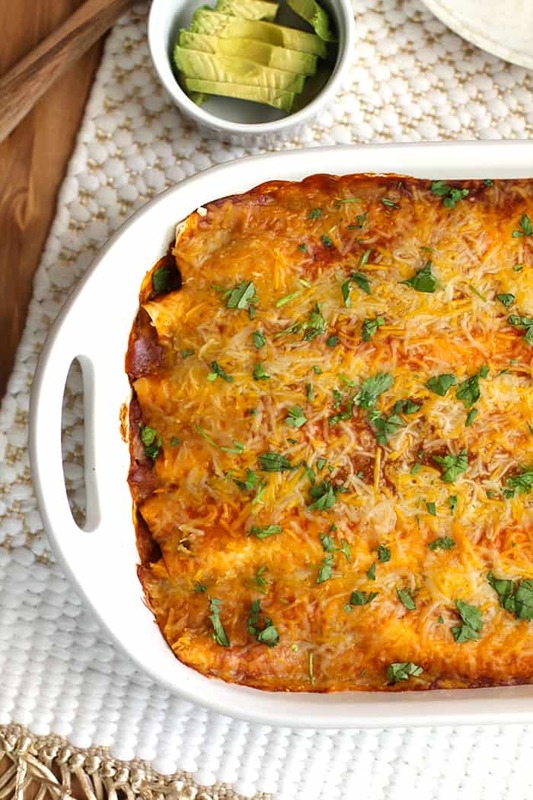 Prepare 9x13 casserole dish by spreading a some of the enchilada sauce all over the bottom. Take one tortilla at a time, spoon beef mixture along middle of tortilla. Roll up and place in casserole dish. Repeat for all tortillas. Pour about 2 1/2 cups of enchilada sauce on top of tortillas, or enough to liberally coat. Sprinkle top with shredded cheese and cover with foil. Bake enchiladas for 30 minutes (covered), and then remove foil and let the top brown up, approximately 10 minutes. Serve with avocado slices, sour cream, and rice. This casserole can be made a day ahead of time, and stored in the refrigerator. Wait until right before baking to place enchilada sauce and cheese on top. 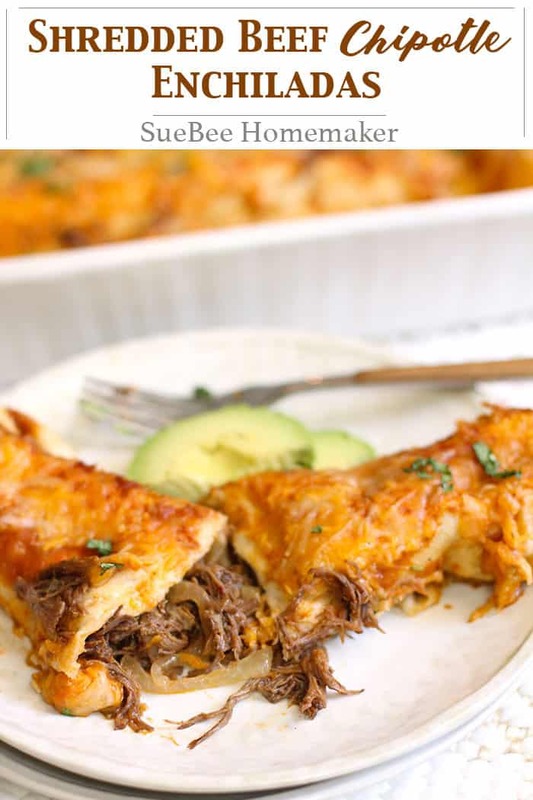 You can also freeze the shredded beef and the enchilada sauce, and then after they are defrosted, put the casserole together quickly before baking. If you want to reduce the spiciness, cut back on the diced chipotles, red pepper flakes, jalapeño, cumin, and chili powder. I have made this enchalada recipe twice, along with the homemade sauce, and found it to be super easy and it was a big hit! I really appreciate all of the detailed instructions and photos. Oh, I’m so happy you enjoyed it! The sauce is the key, and it’s great in my Chicken Tortilla Soup too! 🙂 Thanks for your feedback. Great dish. Family loved it !! Hey, I get the WHY, but hiding food is my trick! These are awesome! More please.